SSC introduce a fresh notification on their official website(www.SSC.nic.IN) related to the recruitment examination for JE Posts all over India under central Government of India. ALL INDIAN Engineering Diploma holder and Graduates can apply for this SSC JE Exam 2019. SSC Recruitment department conducts many entrance examination every year to recruit candidates under Central Government of India, this is one of the major examination conducted by SSC Department every year. Through this examination SSC full fill the vacant positions of Jr. Engineers in various department. SSC (Staff Selection Commission) will hold an open competitive Examination for recruitment of JE (Junior Engineers) under one of the following stream (Civil, Electrical, Mechanical and Quantity Surveying & Contracts) for various Departments/ Organizations in the Government of India. The posts are Group-B (Non-Gazetted), in Level- 6 (Rs 35400-112400/-) of pay matrix of 7th Central Pay Commission. More information related to these SSC JE vacancy 2019 is given below in this job posting article. Educational Criteria: Applicants who have 3 years diploma under one of the following stream: “Civil Engineering/ Electrical/ Civil” can apply for this SSC JE Exam 2019. Those who have passed Intermediate examination in Building and Quantity Surveying Sub Divisional-II of the institute of Surveyors (India) can also apply. 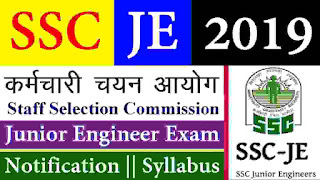 Age Bond: Should have applicants age less than 27 years for applying this SSC JE Entrance examination 2019. You have to pay the above application fee through the online method using Net Banking/Credit Card/Debit card. Choose one of these method which suits you the best for the payment of the application fee. 1ST Feb. 2019 is the Start Date to apply.